For over a century, the history of Longines has gone hand in hand with the history of equestrian sports. So it makes sense for the brand with the winged hourglass logo to devote a collection of timepieces to this long-held passion. Showcasing all of the brand’s distinctive elegance, each model in the collection derives its inspiration from the most symbolic elements of horseback riding, like a sublime echo of the equestrian world. Ambassador of the swiss watchmaking brand for the past 10 years, actress aishwarya rai bachchan, who studied architecture, worked as a model, and claimed the miss universe crown in 1994, embodies the motto of longines: "elegance is an attitude." The forms and materials of this bold new line draw inspiration from eminently symbolic elements. Expressing this passion, as well as the high esteem in which Longines holds its female clientele, the forms and materials of this bold new line draw inspiration from eminently symbolic elements: arches on racetracks evoking horseshoes, stirrups providing the support needed to complete the high jump course, and the fine leather of saddles. 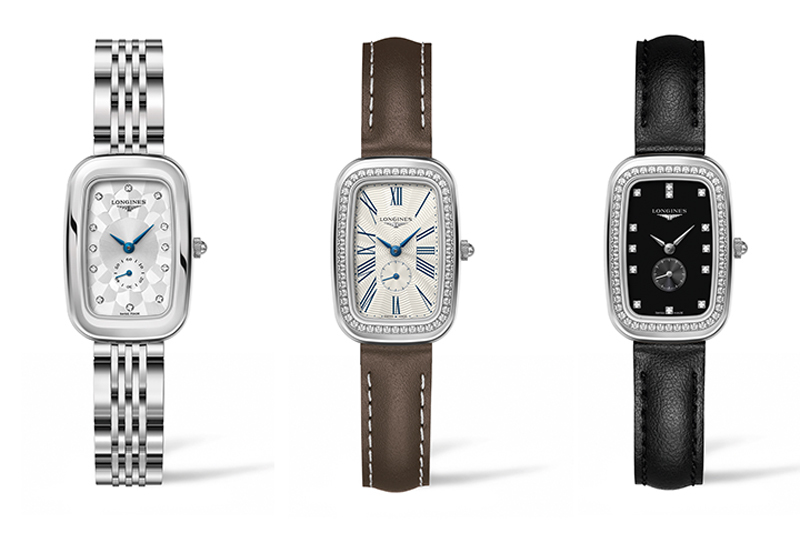 These timepieces, with steel cases available in multiple sizes, come each in a diamond-studded version. While the mother-of-pearl dials are set with diamonds, the silver sunburst dial displays blue Arabic numerals. One model, with a mother-of-pearl dial shaped to resemble a stirrup, also comes in a special version decked out with two rows of diamonds for a little extra sparkle. As the perfect finishing touch, every watch in the collection features an overstitched leather strap. The longines equestrian collection – stirrup functions: hours, minutes, seconds and date at 3 o’clock. round case in stainless steel and in stainless steel set with two rows of diamonds, quartz movement, sapphire crystal with multilayered anti-reflective coating. In 1878, thanks to new mechanical processes, the Swiss watchmaking brand developed its first chronograph movement. This timepiece made it possible to measure performance to the second. By offering this technology, Longines secured a leading spot on American racetracks by the end of the 19th century: the first step in a long history that led the brand to partner with renowned institutions, races, and jumping competitions around the world. A replica of the Lépine model fitted with its first chronograph movement and conserved in the Longines museum, the Longines Equestrian Pocket Watch Jockey 1878 features a jockey and his mount engraved on the back of the case, symbolizing all the elegance, tradition, and performance that constitute the brand’s core values. Produced in an exclusive run of just 20 numbered models, the rose gold pocket watch measures 55 mm in diameter and features a white dial with large Roman numerals and a minute track in Arabic numerals. Its elegant blued steel hands and bow crafted in the image of the original watch provide the perfect finishing touches to this emblematic piece. In 1878, thanks to new mechanical processes, the Swiss watchmaking brand developed its first chronograph movement. This timepiece made it possible to measure performance to the second. 1. The longines equestrian pocket watch jockey 1878, manual winding movement with column-wheel chronograph mechanism, caliber l790.2 (eta a08.l31). 48 hours of power reserve. case with engraved back and sapphire crystal with multilayered anti-reflective coating. 2. This model, held in the longines museum in saint‑imier, served as the inspiration for the longines equestrian pocket watch jockey 1878. Celebrating the elegance of riders and their mounts, these steel timepieces reproduce the lines of the rectangular buckle found on the show bridle of the only Swiss horse breed. Celebrating the elegance of riders and their mounts, these steel timepieces reproduce the lines of the rectangular buckle found on the show bridle of the only Swiss horse breed: the Franches-Montagnes. And the fact that this horse is native to the historical Swiss Jura area, a region that is dear to Longines as its birthplace and the region where it earned its place as an elite watchmaker, only further expresses the brand’s passion for the equine world. 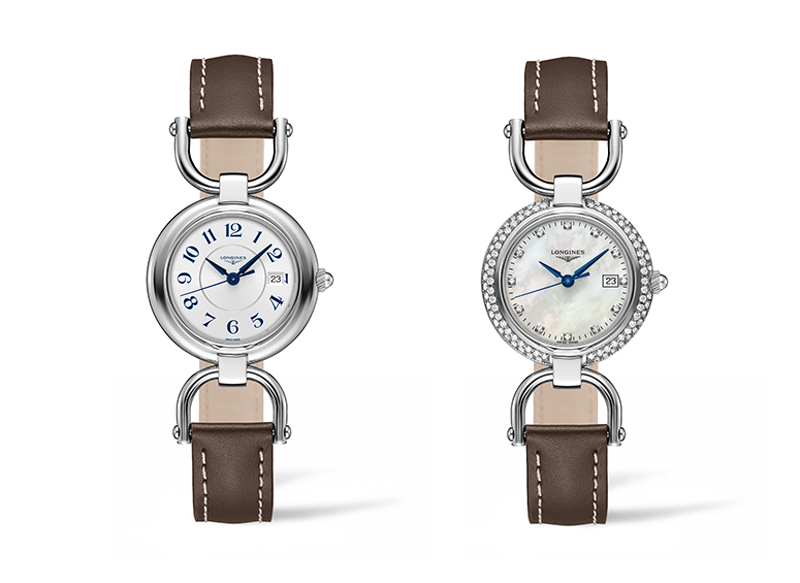 Dedicated to female equestrians and horse enthusiasts, the time kept by these watches seems to merge with the clip-clop pace of the horse’s trot. Both the polished black-lacquered and silver checkerboard pattern dials are decorated with diamond indexes, while the silver “flinqué” dial is decorated with blue Roman numerals. And in a spirit of elegance, a ribbon of diamonds enhances the harmonious curves of the case on some models. In addition, the steel bracelets or leather straps dress up the watches and match the outfits of female riders. The longines equestrian collection – buckle..
functions: hours, minutes and seconds at 6 o’ clock. rectangular case in stainless steel and stainless steel set with diamonds, quartz movement, sapphire crystal with multilayered anti-reflective coating. Lépine pocket watch produced in 1911. this model, held in the longines museum in saint-imier, served as the inspiration for the longines equestrian pocket watch horses trio 1911. 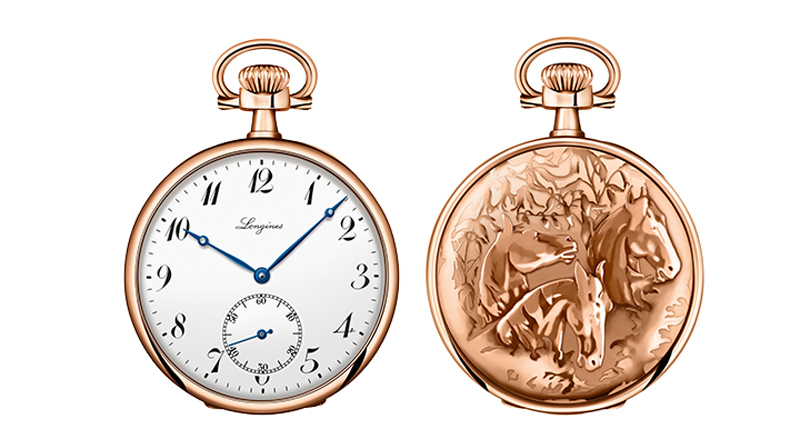 Also produced in a limited series of 20 numbered models, the Longines Equestrian Pocket Watch Horses Trio 1911 takes inspiration from a metal pocket watch produced in 1911 and held in the Longines museum. In 18 carat rose gold, the back of the case is decorated with an engraving of a trio of horses. The heads of these three proud steeds stand out against a background of delicately wrought foliage, while the plant motifs are repeated in the middle of the piece. With a diameter of 48.20 mm, this model features a white dial decorated with large black painted Arabic numerals and a minute circle. With elegant “Breguet” blued steel hands, the dial displays hours and minutes, as well as seconds at 6 o’ clock. In addition, the sides and bow are finely crafted to echo the original Lépine pocket watch that inspired this updated version. 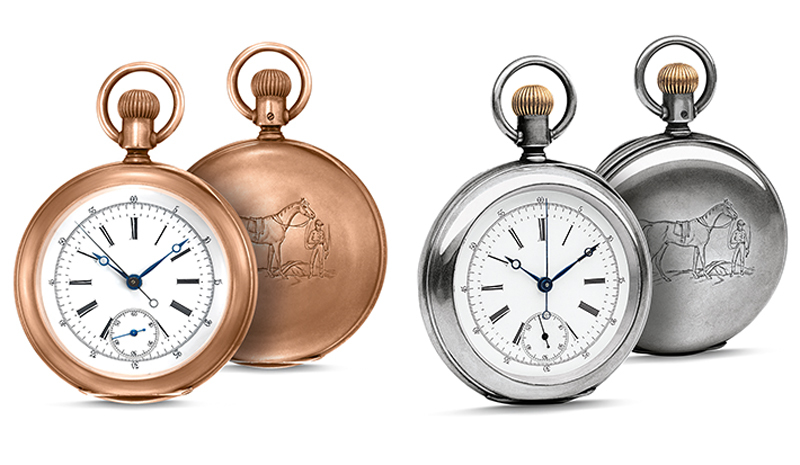 Produced in a limited series of 20 numbered models, the Longines Equestrian Pocket Watch Horses Trio 1911 takes inspiration from a metal pocket watch produced in 1911 and held in the Longines museum. The longines equestrian pocket watch horses trio 1911, manually wound mechanical movement, caliber l878.4 (longines 37.9 abc). 40 hours of power reserve. case with engraved back and sapphire crystal with multilayered anti-reflective treatment.